Real Housewives of New York City star Luann de Lesseps landed in hot water when viewers saw her Diana Ross costume on the show’s premiere Wednesday night. 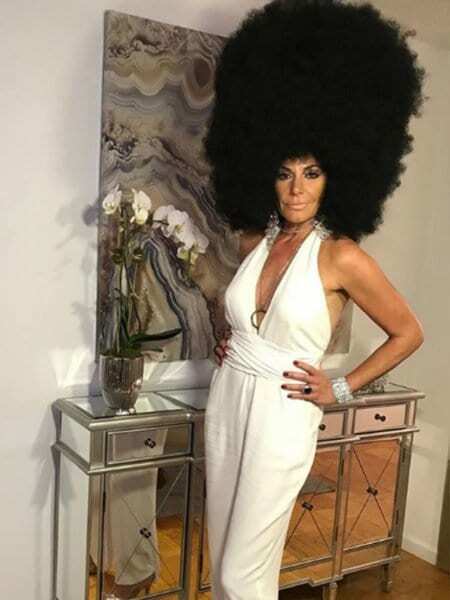 The former contessa showed up to her Dorinda Medley‘s Halloween party dressed as Diana Ross, wearing a white jumpsuit, huge Afro wig, and a noticeably darker shade of makeup. Moments after the troubled housewife who was recently arrested for disorderly intoxication, battery on an officer/firefighter/EMT, resisting arrest with violence and threatening a public servant appeared on the small screen in a Diana Ross costume, folks took to Twitter to call her out. Aside from the bad costume and worse wig, her altered complexion was the main issue raised, although the reality star insisted she didn’t use blackface. By the time Watch What Happens Live aired, host Andy Cohen was ready to take her to task for the outfit choice. “I’m horrified. I never meant to hurt anybody’s feelings. I love Diana Ross and I totally respect Diana Ross. It was really kind of a tribute to her,” Luann de Lesseps said on WWHL. She also issues an apology on social media. The post ‘RHONY’ star Luann de Lesseps faces backlash for blackface costume appeared first on theGrio.